Many of you will have read the reports of our club members who ran London Marathon and some of you may have been inspired enough to consider entering THE Marathon. It’s a lot of work training for your first marathon, but it’s an amazing experience on the day, so if you want to enter, how can you go about it? The first and most obvious way is to put your name down for the main ballot. There are about 17,000 places offered in the main ballot. It used to be that there were 125,000 names allowed in this ballot and you had to stay up until midnight on the day the ballot opened to get your name in. Now it’s different, the ballot stays open for 5 days (closing this Friday 5th May) and as many people who want to can put their name down. This means there is no pressure to get your name in early, but the chances of getting in via the main ballot have dropped from 1 in 7 to 1 in 30 or less, as there will be over 500,000 people putting their name down. I make sure I put my name in to the main ballot every year and have done since 2011, but I have never got a place that way. However, this year I ran it for the third time. There are other ways to get in. The one most people think of with London Marathon, is running for a charity. There are lots of charities linked to the marathon and they pay for the privilege of getting guaranteed entry places. Charities can end up paying a lot of money for these places, £500 or more, so they will want you to raise at least around £2000 for their charity with £100 or more to register for the race. That can mean a lot of work pestering family, friends and work colleagues and running raffles, cake sales and quizzes. Don’t let me put you off, though. If there is a charity close to your heart, then go for it. You’ll have loads of support with training from the club and there will be plenty of runners sympathetic to your cause. For faster runners there are a couple of other ways in: championship entry and good for age. 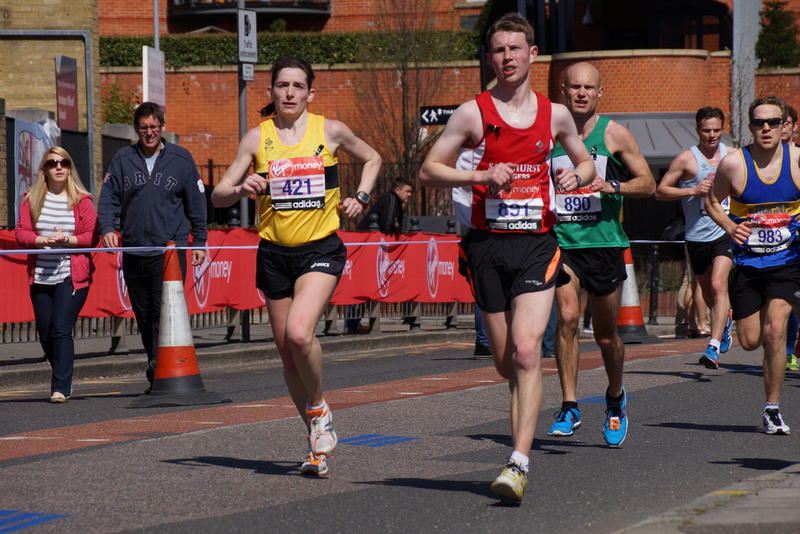 If you’re a member of an athletics club associated with British Athletics and you have achieved a championship-qualifying performance for a marathon (or half marathon) in 2016 or 2017, you can apply for a championship entry place. Then there is the Good for Age route. You will be eligible for a Good for Age entry into the 2018 Virgin Money London Marathon if you have run a full marathon in the same time, or faster than, the times listed below. Well, for the average club runner who happens to be a registered member of England Athletics, there is another way in. London marathon give guaranteed entry places to EA registered clubs according to the number of EA registered athletes they have. So, last year Sandhurst Joggers got 2 guaranteed entry marathon places. We issue those places via our own ballot to EA registered members who have been rejected from the main ballot in that year. So, if you put your name down for the main ballot and get rejected, you still have a chance in the club ballot. (It’s about a 1 in 20 chance, but still better odds than the main ballot). Finally, there is the most fun way of getting a decent chance of a place in the marathon and one you only get by being a member of the wonderful Sandhurst Joggers! Put your name down for being a finish line marshal. You get an amazing experience seeing the glory and pain of the marathon from the elites to the tail enders . You can then put your name in for the marshal’s ballot where there might be 60 to 80 people with a chance of getting one of 30 places. As some of these people will either drop out, or get a place some other way, you often have a better than 1 in 2 chance of getting in. I started my marathon journey with a club place in 2013, which I also ran to raise money for local children’s cancer charity Christopher’s Smile. I marshalled in 2014, tag snipping with Emma Lewis, got a place in the marshal’s ballot being drawn 35th out of the hat for 2015. I marshalled again in 2016 on the approach to the finish and got a place in the marshal’s ballot again for 2017, which was my 48th marathon since that first one back in 2013. Well, training of course. Our coaches James, Carl and Newton can help you with a training plan. Go and visit them at any Friday track session at Bracknelll Leisure Centre. Then, of course, there will be loads of good runs that the club puts on that include all the essential elements of any good training plan, such as intervals (Tuesday and Friday), tempo runs (Thursday), long runs (Sunday at the Lookout and the Canal Run in early April). Come race day and the club helps you even more by providing a coach for travel to the start and home from the finish. It couldn’t be easier! Remember folks, the main ballot closes at 5pm tomorrow, Friday 5th May, so put your name down. You never know where it might take you!